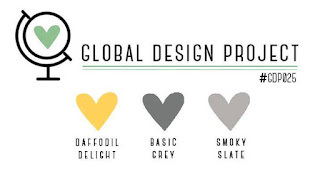 One of my favorite color combos - Daffodil Delight, Smoky Slate & Basic Grey. I have created with this scheme many times before and I was very excited to see that it is the color challenge sketch for the Global Design Project this week!! Even with this being an awesome color combo, I feel that my project today fell flat. I just am not feeling my card! It's cute, I just don't love it and I am not sure why. I decided to share this card today to inspire you. I know someone out there is going to comment that they love it (well that is my hope to prove my argument!). We are always our worst critics and are often too hard on ourselves. I hear customers complain that when they set out to create something, they will sit and stare at a project forever trying to get it to come together. Creating is therapy and a stress release. If you are getting frustrated with something move on! You can call it complete as it is or you can come back to it later. I called this one complete and am being brave enough to post it here! Speaking of brave ... will you take the Global Design Project challenge this week? Click over to read about the challenge details. You will see the design teams projects and the followers submissions. That is a lot of inspiration in one place! March 1st for an International blog hop featuring spring catalogue projects. March 2nd I will have the latest Stampin' Up! Artisan Design Team blog hop. March 4th's post will be celebrating International Scrapbooking day and I will have my weekly TGIF post! Phew! I had better get stamping! Have a creative day!